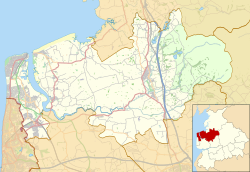 Myerscough College (pronounced as Myerscoe) is a Higher and Further Education college near Bilsborrow on the Fylde in Lancashire, England. The college dates back to the 19th century, when it was known as Lancashire College of Agriculture. The original college was based to the south of Preston near Hutton, and moved to the current site in 1969, as recorded by a stone plaque on the teaching block built at that time. The new college was built on the site of Myerscough Hall, near St Michael's Road in Bilsborrow, and is in the rural parish of Myerscough and Bilsborrow. The college occupies the substantial grounds previously occupied by the hall and farm, extending to River Brock on the north side, and St Michael's Road on the south. The college also leases several local farms, including Lee Farm and Lodge Farm, for agricultural research and teaching purposes. The college estate extends to 605 hectares, and the campus has extensive residential accommodation. The college offers both further and higher education. The University of Central Lancashire validates the college's degrees and there are special links with two universities in the USA. Other centres have also been added in Blackburn, Liverpool, Manchester and Dorset. Each offers a variety of land-based and sport courses. The Myerscough Centre in Dorset, the Lynwood Veterinary Hospital, specialises in veterinary nursing. In 2011 the college had over 7,000 students, of whom 2,500 were full-time, with about 1,000 studying Higher Education. Subjects to study at Myerscough College include arboriculture, agriculture, ecology, countryside management, motorsports, mechanisation, sports and leisure, golf, landscape design, animal care, equine studies, horticulture, sportsturf, photography, and farriery/metalwork. Short courses for industry range from crane handling to crop spraying, and short leisure courses from caravan manoeuvring to floristry. Myerscough has also been in the forefront of developing on-line and blended learning courses for the land-based industries, allowing students to work full or part-time and to study on-line to complete foundation degree and Honour degree programmes. In August 2005, the college announced a partnership with Lancashire County Cricket Club where they would offer students the opportunity to study at the club's indoor cricket centre for a national diploma combining academic studies in sport with practical skill development in cricket. Myerscough College is home to the National Centre for arboriculture, and is recognised internationally for its specialism in this subject. There is an international equine arena, a nine-hole golf course and simulated golf training centre, the plant centre, an off-road driving track, nine-hole disc golf course, sports fields and a sports centre and gymnasium, as well as an arboretum, woods, fields, ponds and the River Brock on the site. The Frank Peregrine Higher Education Centre was opened in 2006 and extended in 2010. In addition, the college houses the Rural Business Centre, which provides support for rural business in the form of courses, advice, links and the Rural Business Incubator for startup businesses. The sports centre, which cost £1.8M, was opened in 2004, and contains a golf studio. In May 2007, the college opened a milking parlour at Lodge Farm which can facilitate 50 cows at one time, which the college stated showed their long-term commitment to agriculture. A further development in sport came in 2016 with the opening of the High Performance Sports Centre. The state-of-the-art facility cost £3.2 million and compliments the College’s existing Sports Centre. The works consisted of the demolition and removal of an existing Sportsturf centre and workshop, as well as the demolition of a derelict, disused pavilion, to make way for the erection of the new build, which includes a purpose-built hall as well as a Strength & Conditioning suite and offices, and a separate new Sportsturf Management facility. In 2017, the College opened its Food and Farming Innovation and Technology (FFIT) Centre, a sector-leading centre of excellence for industry training and research in beef production. On the site of Myerscough’s Lodge Farm, the FFIT is a major flagship build for agriculture and associated courses at Myerscough. The main FFIT Centre consists of a red brick, two-storey building to house the research and teaching facilities that link with the various technologies in the nearby Livestock Innovation Centre and farm. The FFIT Centre also boasts facilities to support food research and development with the aim of creating a resource that both local businesses and students can use to investigate opportunities to process and add value to on-farm produce. Paul Burgess, head groundsman at Real Madrid's Santiago Bernabéu Stadium He formerly worked at Blackpool's Bloomfield Road and Arsenal's Highbury and Emirates Stadiums. Joe Bunney, footballer for Rochdale F.C. ^ a b c "Garden guru at college". Blackpool Gazette. 2006-09-22. Archived from the original on 2007-09-28. Retrieved 2007-09-07. ^ "Myerscough". GENUKI. 2006-06-01. Retrieved 2007-09-06. ^ a b c "Myerscough & Bilsborrow Profile". Lancashire County Council. Retrieved 2007-09-06. ^ a b Wade, David (2007-05-24). "College invests in milk parlour". Blackpool Gazette. Archived from the original on 2007-09-28. Retrieved 2007-09-07. ^ Ettridge, Lisa (2007-03-14). "Gardens expert in BBC2 role at college". Blackpool Gazette. Archived from the original on 2007-09-28. Retrieved 2007-09-07. ^ "The Horse Whisperer to appear at college". Blackpool Gazette. 2006-10-04. Archived from the original on 2007-09-28. Retrieved 2007-09-07. ^ Robinson, Joe (2007-02-21). "Royal visit for Fylde college". Blackpool Gazette. Retrieved 2007-09-07. ^ Butler, Heather (2007-06-22). "Bishop of New York visits Fylde". Blackpool Gazette. Archived from the original on 2007-09-28. Retrieved 2007-09-07. ^ "Myerscough's Lancs link". Blackpool Gazette. 2005-08-02. Retrieved 2007-09-07. ^ a b "Putting the fun into college course work". Blackpool Gazette. 2004-12-08. Retrieved 2007-09-07. ^ "Introducing….our High Performance Centre for Sport". Myerscough College. Myerscough College. Retrieved 25 May 2018. ^ "OFFICIAL OPENING: Agriculture at Myerscough College is FFIT for the future". Myerscough College. Myerscough College. Retrieved 25 May 2018.